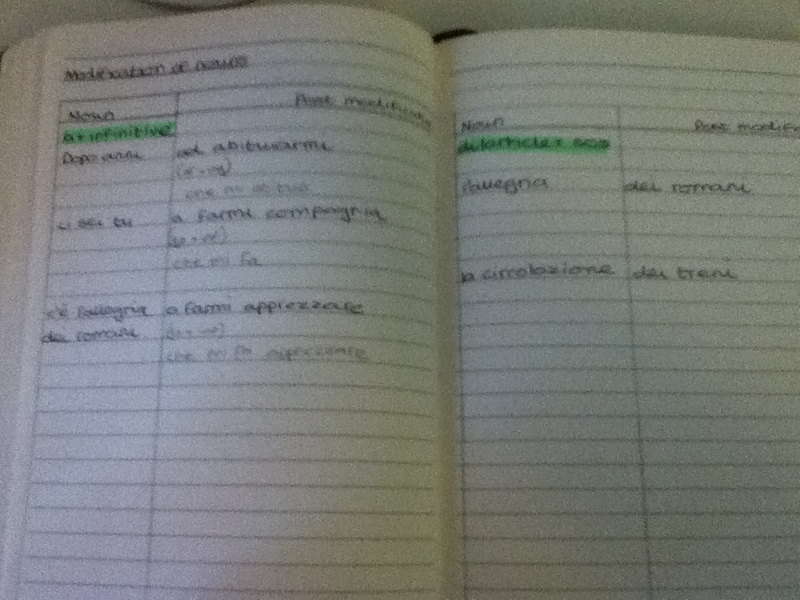 In a previous post, I talked about lexical notebooks without really explaining their make-up or meaning to me. I need to admit right at the start of this post that I am no expert in keeping a lexical notebook or linguistics, nor do I consider myself a good language learner. 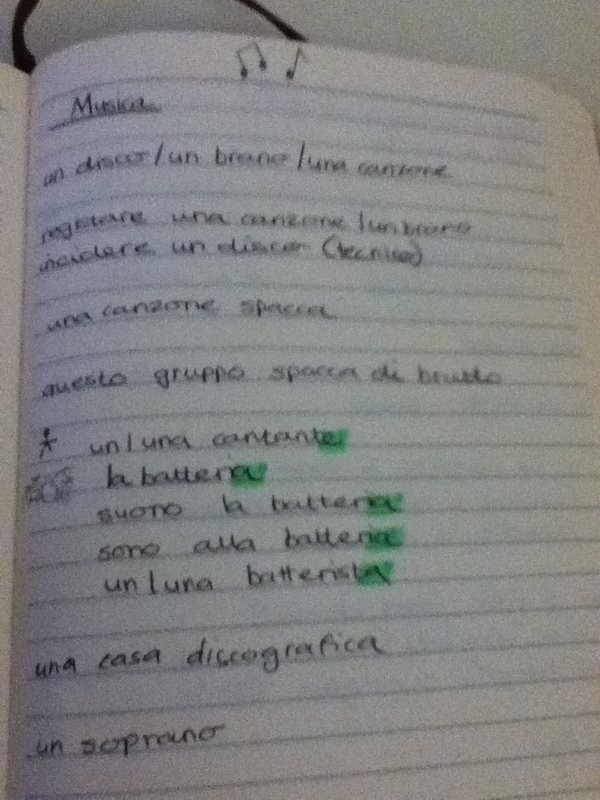 However, I have found that keeping everything in one place, using a few techniques which I hope to demonstrate below, and a bit of revision, I have become a better learner of Italian lately and above all more confident and secure in my learning. The learning of idioms, especially for exams like CAE and CPE, is vital for many of our students. I dedicate pages of my book to lists of idioms which have come up in conversation or which I know there is a corresponding phrase in English I use. What are the problems I have encountered when learning idioms in Italian? I never remember idioms when I read them listed on a page of a book of idioms. To remedy this I type the idiom into Google in various forms (past, future, infinitive) and look at the different contexts in which it appears. I take a few examples and write them in my book. The more information you have about a word, the more likely you are to remember it and reproduce it. I either ask a housemate to give me a paraphrase of the idiom or try to think of one myself. This expands my vocabulary, utilises more of my linguistic resources and gives me a point of reference for meaning (in Italian) when I need to revise. Learners of English are lucky enough to have a plethora of online resources available to them in the form of websites and corpora. In a recent development project a colleague of mine and I developed some materials using examples from The BNC and Google Corpora to encourage students to deduce meaning of idioms from context. There is definitely some promise in this idea, I would like to include this in my learner training this year, including exercises with idioms and teaching students to use these tools available to obtain more information about a phrase/idiomatic expression on their own. David Warr’s Language Garden blog and seeing a student of mine using these inspired me to start doing the same myself. It is visually stimulating and adds a little variety to my book. In fact, I found that I kept making mistakes with this word ‘cena’ and realised it was time to put things straight, so I dedicated a page of my notebook to remedying this problem. I am the sort of student that self-monitors a lot, correcting myself and being very aware of the mistakes I make. On the plus side, it gives me lots of material to learn by myself. One of the most challenging obstacles to overcome in Italian is when to use their subjunctive tense. Ask an Italian and they will rant for hours about the inflection of Italian verbs and how hard they are to learn, but I have certain reservations about the difficulty of learning verb endings; there’s no thinking required, no depth. Having not had much success with the pedagogical grammar rules recited to me in Italian class a few years ago, I thought a new solution was needed. I came across something called colligation, which I understand to be the grammar patterns which are contained within the DNA make up of a chunk. E.g. ‘have an affair’ appears in the BNC in almost all cases in the continuous tense (past or present). It seems worth making a record of these syntactical secrets when teaching and learning to help students use phrases in the forms in which they are found. In this case I have opted for a longer distance colligation, based on general usage of the subordinate clause with a verb. I have heard the term ‘based on usage norm’ and this is what I have used. I keep a record of what type of verb follows certain expressions (indicative or subjunctive) and base my usage upon that. It means I have a store of chunks I know are followed by a subjunctive, reducing the cognitive load while I speak and cutting out the need to learn too many confusing grammar rules. I can keep a record of style-sensitive changes in the use of these two moods in Italian. That way I do not end up sounding like an academic in a chat with some friends when I am out and about. In English this could take the form of the stylistic differences between ‘will’ and ‘going to’. Mostly on Google, looking at the context in which the phrase is used: facebook or social networking sites = more spoken, newspapers etc = more formal, interviews with political figure = more formal. I admit it is not fail safe, but for learning independently it helps. Add an adjective before a noun and you pre-modify. A noun which has a pre-modifier can then be extended with a post-modifier. Students studying English who need to use more complex sentences could really benefit from this knowledge. OK, that is enough demonstration of pre/post-modification. If you have been seduced by them then I suggest reading Dave Willis’ ‘Rules, Patterns and Words’ (2003). I keep a record in my book of the lexical and grammatical patterns of Italian syntax. Italian is a heavily post-modified language so I focus my efforts on noticing the types of structures that occur after the nouns. 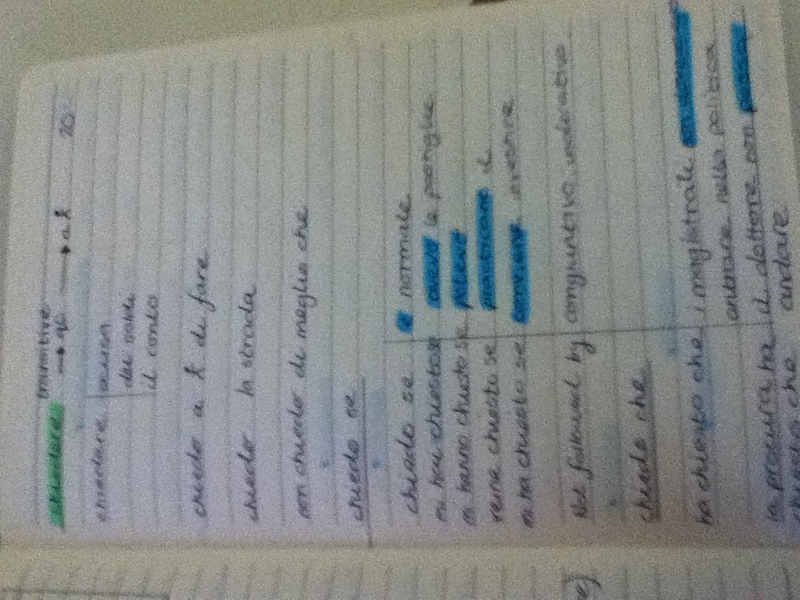 As I have no Italian teacher, I try and paraphrase the example to help me understand it more and ask friends to help me. 1. 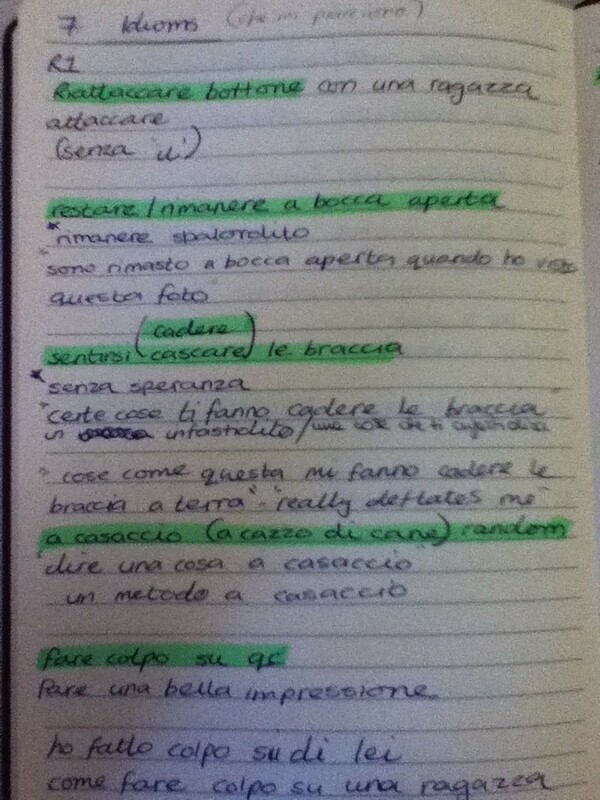 I am better able to deconstruct complex Italian sentences. 2. I can contain more information in a spoken sentence. Words attached to a context are of course of great benefit to a learner of a another language. For this reason I make sure I keep pages of vocabulary I have found or heard concerning topics I usually talk about. You might notice some highlighted areas. These are areas I need to be careful of because of mistakes I know I have made in the past. How does this translate to my teaching? 1. I encourage students to find as much information about an idiom as possible, as it makes it more like to be produced. Training learners to find examples and decide which idioms are useful for them i.e. are they likely to use them? One does not buy films or books that are of no interest, so why idoms? 2. I teach ways of keeping vocabulary organised in a notebook, giving learners a push away from long list of decontextualized words and towards fewer words and kept in the company of their lexical friends. 3. Show students the importance of knowing the grammar contained within the phrases we use, where to find it and how it can help them learn fewer grammar rules and use grammar better and more naturally. 4. I teach and encourage students to improve their use of phrase structures, like formulaic expressions but formulaic structures. 5. I want to encourage students to ask more questions about the the grammar they find in use, noticing common structures and recording them in a sort of basic form to be called upon and used when needed. 6. I give homework that involves mining articles which interest students for lexis/collocations/phrases that interest them, hoping that this might become a habit. In this post I have looked at form and meaning, using examples of how I have adapted what I have learned about language to learn Italian, translating my second language learning experience into how I teach. I have missed out pronunciation, which will form the basis for a future post. That’s it Dale. The final straw. You’ve set the teaching bar too high.I’m quitting to work in McDonalds. Or in other words, fantastic post. Every one is like a DELTA module and sends me off on a new path of EFL discovery. I’ve just started teaching inhouse and am applying lots of your ideas as I have very few materials and best of all, the students are motivated. The first thing I did was buy a notebook and it’s proving to be very useful. Keep it up mate. There’s a DOS or DELTA trainer position for you somewhere I’m sure. Hi Phil, thanks for your kind words. All of this came from my DELTA LSA 4, the observed module. I don’t know what mark I got in the end for it, it doesn’t really matter to me. Having come away from it with all these ideas is more than enough to motivate me. At the moment I can’t wait to get back into the classroom on Friday and start putting all these ideas back into practice again. The first thing I plan to do is chat a little about I believe languages are learned. Homework week 1 for each student will be to buy a notebook. I want to then structure lots of future homework assignments to develop notebook-skills and check students’ notebooks regularly to see how they are getting on. Nice to hear you’re having lots of success with your new students. They’re very lucky to have you as their teacher. Motivated students are the easiest and most satisfying to teach. I’ve spoken to a few teachers about student notebooks and before term starts we all seem gung ho about asking students to get them and keep using them but some don’t or are still in the mentality of use giving them handouts. One friend always used her own and student ones in high level classes so that students could see and learn things that came up. It also proved that they were learning and not just talking. On my DELT Mod 3 I planned a course incorporating learning blogs into a BL course which I used to some extent afterwards. Students kept all their vocab/language notes/lists on their blogs, with links to definitions and then wrote their own examples/texts. I could then access them, leave comments but best of all they could and did comment on each others blogs. They found adding photos, videos, links etc fun but really helped them learn and remember stuff. Interesting! It reminds me of something I read from a Brazilian ELT bok author and teacher trainer. Of course, your post is full of details, but really related to each other. Congrats. and then you say you don’t consider yourself a good language learner? C’mon man this is high-order learning strategy. wish my students (and myself!) were able to work at this level of organization and systematic mindfulness towards lexis. Another great post, Dale! Keep blogging, please. I Willy, thanks for the comment. I have a habit of being negative about my language learning abilities, place to much pressure on myself etc… the type of student I empathise with the most in the classroom. Lexis is an area that really fascinated me whilst doing reading for DELTA and it’s nice to put some of the ideas into practice, both for my learning and my students’. I’ll keep on thinking and posting. Let’s hope I can inspire my learners with some of this systematic mindfulness towards lexis. I’m thinking of showing them my book as an example of what can be done and then asking them to try out some of the ideas, slowly adding more emphasis each week and introducing new ideas so that by the end of the course they should be well trained and above all enthusiastic about the idea. I ask myself though whether I should enforce it as a classroom routine though? Great stuff Dale! I hope it helped with your “cena”. The whole post is, as usual, a rich mix of theory and practice. Like you, I believe I’m not (or wasn’t) a natural language learner, but working with chunks, collocations and colligations helps me enormously. Have you seen the Greek lesson I’ve just posted with Vicky Loras. I’m sure that before I started using language plants, I wouldn’t have been able to learn so quickly. You know what? It really did. I guess we’re all language learners in some way, it’s just finding the best way for us to feel confident about our own language knowledge. This has been a recent development in my learning and as much as I’d like to say it’s made me a better speaker of Italian, I wouldn’t know. What it has done however is make me feel a lot more confident, and much less lazy! I’ll be interested to see some of the results this year, no doubt there’ll be a follow up post with some student feedback and some examples of student notebooks. I took a look at your Greek language plants, it’s all very visually stimulating, it makes me want to learn Greek! Definitely the best post yet imo Dale. As David says, its’ the ‘rich mixture of theory and practice’ that I like best. Most blogs – elt writers in general for that matter – are one or the other …and therefore easy to dismiss as either unfounded or impractical. This post is full of both substance and practicality. How much more of your DELTA have you got to go? Wish I’d made use of the course as thoroughly as you seem to be. Thanks very much. In fact I finished DELTA in June, it’s just the ashes are still settling and I’m coming up with ideas and thinking “ah yes, I remember reading about that!”. Strange that this post was actually the easiest yet to write! ‘I give homework that involves mining articles which interest students’. I think that is a great statement. If they’re interested they’ll read and maybe read again. They’ll also want to know everything in the text and want to figure out what things mean. What kind of guidance do you give though? I think small texts are emphasised by Luke and Scott and it’s amazing how much you can get out of something that’s just 1 paragraph. From trial and error I found that the grammary bit has to be short with my classes otherwise they lose steam for the practice writing. The first one I did I think was too big and there were endless structures in there. The second they/we managed to categorise and then build on/play with. This was very interesting but I think some used to ‘spoon feeding’ got lost. Others really loved it. Today I did something similar with a 4 line email and after analysing, discussing and extending the student wrote a quite good version of her own. There’s definitely a lot to be said about getting your hands dirty with texts which gist/detailed comp questions don’t do justice. P.S. TEFL.net blog of the month/year anybody?? You get my vote. Totally. I’m quitting too Dale – I can’t keep up!. Your stuff is amazing and I have learnt so much from reading your blog. Couldn’t agree more about the “mix of theory and practice” thing. I love the idea of a “DNA make up of a chunk”. Great way of thinking about it. 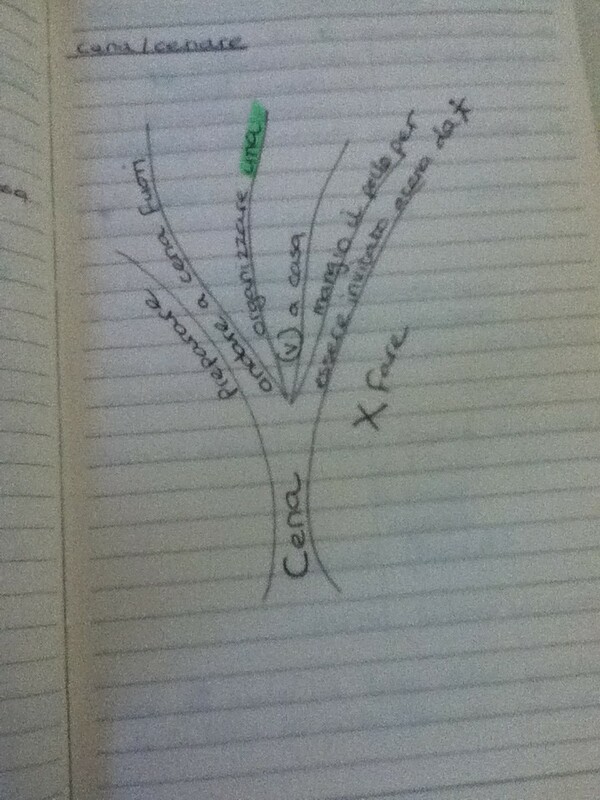 And loved the collocation tree. 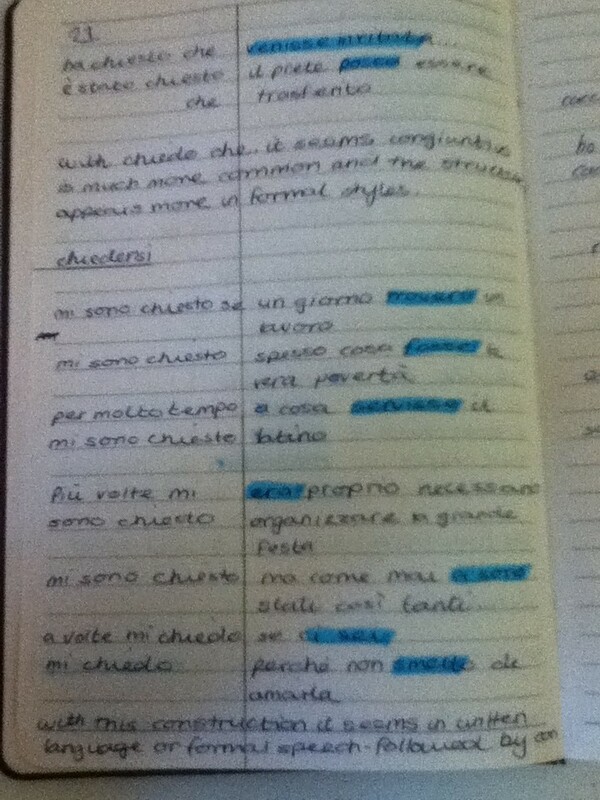 Definitely will use this with my new group of Italian (!) 18 year olds who I am starting teaching on Monday. Most of all your post reminded me how important it is for a language teacher to be a language learner too – vital to keep that element going. Having just moved back to the UK you have inspired me to bring back that “foreign” language element which was with me all the time when teaching abroad. Easy to get stale in the UK. By the way everyone , having been on the Delta with Dale I can vouch for the fact that he was like his blog in real life every day!! . He was so full of ideas and his ability to balance between theory and practice really came across in all our sessions. Upwards and onwards Dale! Found this a really useful post with a lot of ideas that I want to pass onto my students. Have just posted a link to it on the TeachingEnglish facebook page if you’d like to check there for comments. Ann, thank you for sharing this and letting me know about the TeachingEnglish facebook page. I’ll make sure I post my next installment there too. Thanks to Leo for suggesting I take a look at this post and then me actually finding it again through a paper.li link that led to 4C. Connections, connections, connections everywhere! All the methods, with their comprehensiveness and variety are inspiring. Thanks for the visit, Tyson. What sort of sharing tool are you referring to? I don’t see any share for Twitter, for example. Do you know how I can add that widget on wordpress? I came to this article through an article on the British Council website about lexical notebooks. Good stuff and good examples though I couldn’t really see the pictures clearly when I clicked on them. One thing I’d like to know is exactly how you get your students to structure their lexical notebooks. I know you’ve mentioned the different sections, but how does it fit overall in a notebook? I teach IELTS in Singapore and I’m getting my students to use lexical notebooks so I’m doing some research on organizing a lexical notebook. Hi, thank you very much for stopping by. As for sections in the book, it’s very much dependent on the course and the learning needs of the student. I normally encourage a topical and functional organisation for the book; language to do things in other words or to talk about different situations. You could organise it according to the different requirements of students for IELTS: describing trends, comparing, adding opinion etc etc. It’s very interesting indeed. We r really benefitted. Teaching by following this method will be very effective.We want to know more and more……. I’ve just come across this Dale. Excellent examples. of course I use lexical notebooks a lot but restrict the students use at first until they have mastered noticing collocations, which i think is the biggest trick. The lexical notebook gives a great strategy for students to hone in on collocations rather than single words. You have to almost ban them unless learners will revert to single word learning. I am more for collocations in context rather than the others but like them all. The problem I feel is that if we do too much at first when implemenating this strategy the students get confused and abandon it. It is a balnacing act. There is just too much sometimes and mastering collocation is the major aim. One area you don’t seem to include, which I religiously stick to is syntactic forms Verb + noun, adj + noun and organise these in context as I explained in http://www.teachingenglish.org.uk/articles/lexical-notebooks. this gives a more form focused view of collocations and if we use the main combinations/forms student can appreciate collocations much more. I feel starting out quite restricted and then moving students onto items like colligations and your trees (luv it), is wise. Congrats of the blog and this excellent article.